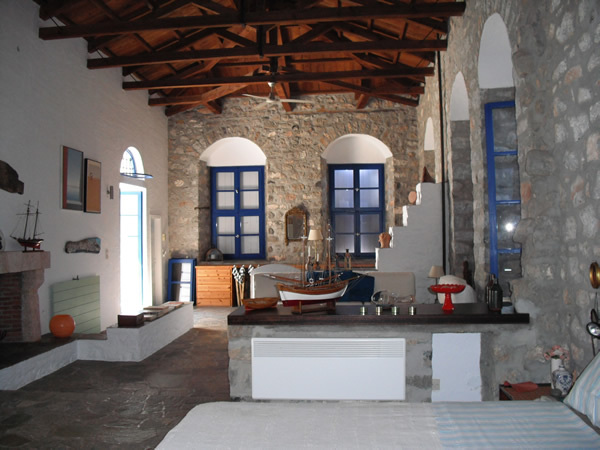 The two storey Sea Captain’s Villa was built in the middle of the 19th century. 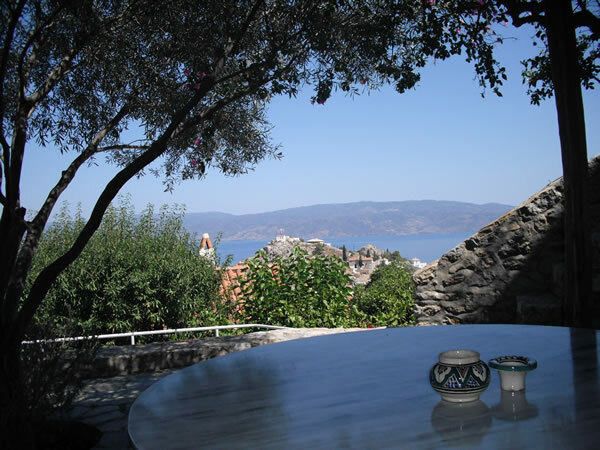 Its position was selected for its excellent vantage point atop the mountain of Hydra overlooking the village of Hydra and beyond towards the Saronic Gulf and the Peloponnese. 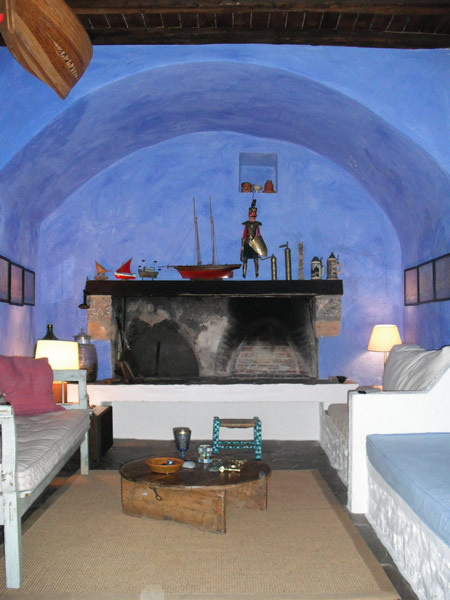 In 1974 it was bought by its current owner where a famous Greek architect was commissioned to reconstruct it with care and respect to its history. Nine years later the Villa was awarded by the Greek Ministry of Culture the national prize for the best-reconstructed house in Greece. 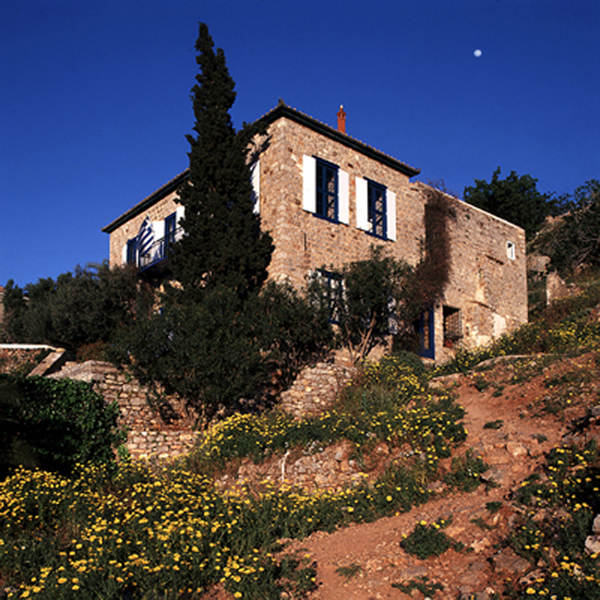 In 2002 the Villa was partially renovated and a small pool was added. Reaching the Sea Captain’s Villa after a short walk from the harbour of approximately 800 meters, one passes through a unique and multi-leveled external atrium to enter in the magnificent stone built Villa. The Villa sleeps 2-6 people. The living room with the fireplace, the open plan kitchen, dining and one double bedroom with wc are on the ground floor, creating a relaxed atmosphere while functionally working all together. There is also an office, pool, large terraces as well as a guesthouse. The master bedroom is located on the upper floor. The 6 x 12-meter open plan area is comprised of a sitting room, fireplace, a king size bed and en suite. The split level terraces offer a fascinating view of the island, its picturesque houses and the vivid blue of the Mediterranean as its background. To the rear immediate access is offered to the external terraces, whilst on the front one can relax atop the balcony overlooking the front terraces of the Villa and the panorama below. The local vegetation with the olive trees, the cypress tree and the colourful bougainvillea in combination with the turquoise of the pool make the visitor feel at ease with the environment. The Sea Captain’s Villa combines the old-world-charm with all modern conveniences offering a relaxed and enjoyable stay in a superb Villa on a beautiful island. 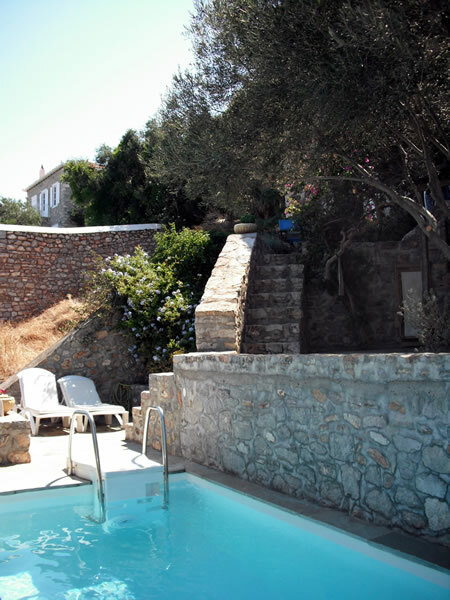 The Villa is on Hydra island, one hour and a half from the harbour of Pireous. One can reach Hydra by hydrofoil (1.5hrs or by boat 3.5hrs). 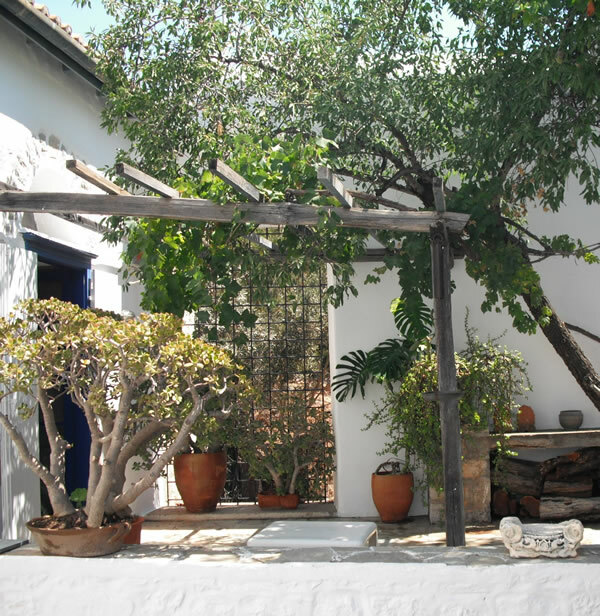 Once at Hydra one reaches the Sea Captain's Villa after a short walk from the harbour of approximately 800 meters. One walks through stone paved narrow little streets and alleys, through house yards, stone arches etc. 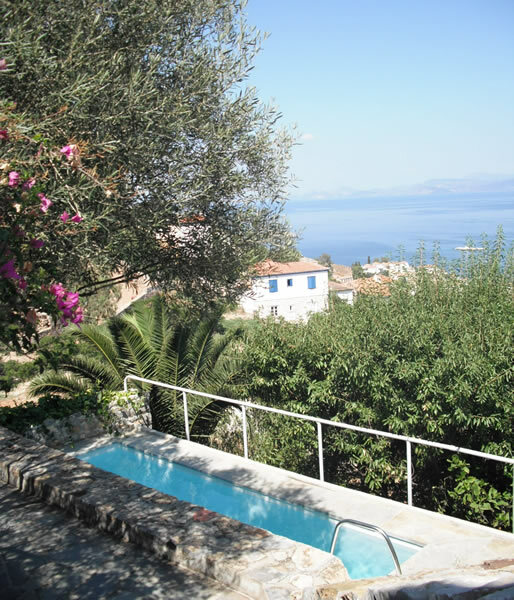 The Villa is at the top of one of the island's hills with great views of the Saronic Gulf and part of Peloponnese. bedroom 1: 1 x queen double, 2 x sofa bed, 1 x Lower floor. Open plan with kitchen area. Doors to separate. Semi private. The bedroom at the ground floor with the fireplace has doors that close and give privacy from a semi-open plan area. The second bedroom on the ground floor is a full bedroom. One bathroom on the ground floor. On the upper floor, there is a large area (approx. 6x12meters) where the masterbedroom is, with fireplace and en suite bathroom. bathroom 1: shower, toilet, Lower floor, view of the island from a small window! Children of 14 years and above are welcome! 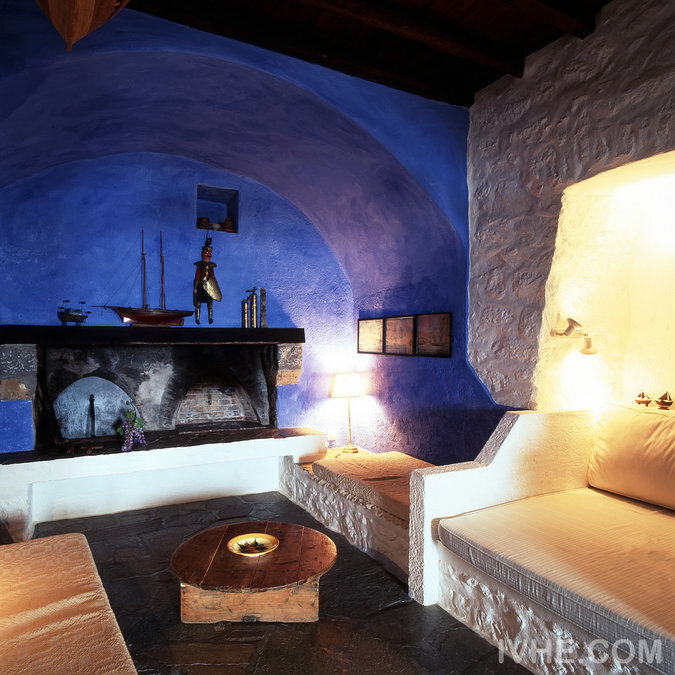 The villa is multi leveled; this could be unsuitable for very young children. Please note that the time given above is from the house to the main harbour. There are a few beaches that one can walk to from the house, but there are others that one has to go to the harbour first and then take a boat or water-taxi to reach the beach. For example, for water skiing, surfing and fishing one has to go primarily to the harbour and then to a beach etc. Hiking/walking can be done all around the island, so the time scale varies. From Athens International airport 'Eleftherios Venizelos' one can get to Pireous harbour by an 'Express Bus' or by taxi. Also, by metro from the airport with one change of lines. Once at the harbour at the area where the hydrofoils leave (area of Agios Spyridonas) the visitor can get the hydrofoil or 'Flying Dolphin' that will take them to Hydra island sfter approximately 1.5 hours. There are no cars on Hydra island. Once the visitor is at the harbour we'll have arranged one or two donkeys for them to take the luggage up at the house. Again, the donkey-luggage-ride is about 20-25 euro. The Captain's quarters were in fantastic shape and along with the great flowers in the garden really showed as in the photos. The views were spectacular and both the Island of Hydra and the Port was a great and fun experience. Dealing with the owner and her support people on the Island was very easy and a pleasure at all times. We would like to thank them all for a Wonderful experience and a great way to start our summer vacation. As always the support and efforts from IVHE were great. We had to try to stay at this property for 3 summers and we were able to coordinate this visit just into the summer high season.